Ultrasonic Fuel Injector Cleaning Service. Optimum fuel economy when wanted - Optimum horsepower when needed. We clean, test and refurbish all makes and types of fuel injectors, idle control valves & cold start injectors using several state-of-the-art machines and testing apparatus. This apparatus allows us to diagnose faulty injectors under simulated engine operation - we can sometimes even bring faulty injectors back from the dead! With over 10 years experience you can be sure your injectors are in safe hands. Car, motorcycle/scooter, marine, mechanical and even carburettors are a routine service for us. We have cleaned and serviced thousands for customers all around the world. We fit new o-rings, filters, pintle caps and other service parts where possible (a small additional charge is made for hoses and clamps on hose fed petrol injectors and o-rings for side fed injectors where available and requested). We stock service parts for 90% of all petrol injectors including Bosch, Weber, Keihin, Sagem, & JECS. We are able tooffer a service for all injector types including MFi, GDi, (though regrettably cannot service BMW DI injectors from N54 and similar engines, or any diesel injector). The following video demonstrates our work in greater depth. More detailed information about our service can be found here. Typically, after 50,000 miles of use a set of injectors will have a 6% flow rate imbalance, leading to both lost power and fuel efficiency. Furthermore, a 5 micron build-up of dirt is common after only 120,000 miles - causing as much as a 25% reduction in flow rate and a heavily distorted flow pattern. A 15% reduction in both horsepower and fuel economy is expected after only 60,000 miles of driving under normal operating conditions, which increases to a maximum of about 22% at 150,000 miles. There is no better way to reduce your fuel expenditure than to fit injectors ultrasonically cleaned and serviced to'as new' condition. Are'fool's gold' with impossible scientific claims that no maker has been able to substantiate in court. Even in-tank cleaners are near useless by comparison with ultrasonic cleaning. 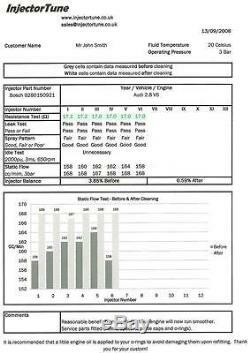 This is an example of our petrol injector test report. 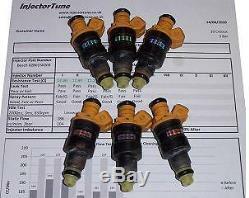 Receive, refit and benefit from having injectors which function'as new'. We do not accept cheques. We were shocked by the standard of the'service' we received, though they support the old adage that'you get what you pay for'. Here is what we found. They are most likely fraudsters. Please add our store to your favourite sellers list. New items are being added on a daily basis and we may have what you are looking for! We aim to answer all questions within 24 hours and are happy to offer advice relating to all automotive issues for free. All our items are tested under simulated engine operating conditions before dispatch and are security marked to prevent fraud. However, should an item appear not to function when fitted it is highly likely that the item was not the cause of your problem. We are happy to leave excellent feedback for our customers using our automated feedback system. We will do everything reasonable to address your problem. 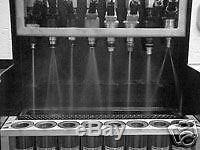 The item "ULTRASONIC FUEL INJECTOR CLEANING SERVICE CLEANER" is in sale since Monday, October 13, 2008. This item is in the category "Vehicle Parts & Accessories\Car Tuning & Styling\Fuel Systems & Injection\Other Fuel Systems & Injection". The seller is "su_nioj" and is located in Devizes, Wiltshire.